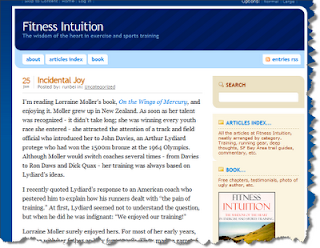 Here's an interesting article about Arthur Lydiard and my sister, Lorraine Moller. The author, George Beinhorn, has written a book about running and fitness. While I have not read it, it does appear to worth getting hold of. Click on the image to the left to read on his website. Lorraine's book, On the Wings of Mercury, is available here.